Changes in artistic style as a result of brain damage or dementia make the case that art can serve as a window into the workings of the human brain.© EMMANUEL DUNAND/AFP/GETTY IMAGESWillem de Kooning, the famous Dutch-American abstract expressionist painter, continued to paint for several years after developing Alzheimer’s disease. But his paintings were different somehow, more deeply expressing his abstract style, according to some art critics. De Kooning’s change in style explicitly makes the case that art can serve as a window into the workings of the human brain, that when the brain changes, so too do artistic expression and perception. But what in the brain triggers aesthetic experiences? And how does knowledge of basic brain mechanisms inform our understanding of these experiences? These questions are at the heart of an emerging discipline dedicated to exploring the neural processes underlying our appreciation and production of beautiful objects and artwork, experiences that include perception, interpretation, emotion, and action. This new field represents a convergence of neuroscience and empirical aesthetics—the study of aesthetics rooted in observation—and is dubbed neuroaesthetics, a term coined in the 1990s by vision neuroscientist Semir Zeki of University College London. Neuroaesthetics is both descriptive and experimental, with qualitative observations and quantitative tests of hypotheses, aimed at advancing our understanding of how humans process beauty and art. While the field is still young, interest is growing, as evidenced by several recent books on the topic. Moreover, recent workshops such as “Pain and Pleasure: The Art and Science of Body Representation,” held in Venice last November, and “Visual Arts and the Brain,” held at the Royal Society of Medicine in London the following month, demonstrate the international scope of this discipline as it addresses various aesthetic experiences, and their underlying neural correlates, in health and in disease. Alexander Calder, 1975© LUKE MACGREGOR/REUTERS/CORBISEarly neuroaesthetic writings in the late 1990s by Zeki and University of California, San Diego, neuroscientist Vilayanur Ramachandran identified parallels between an artist’s approach to her visual world and her brain’s processing of visual information. Light entering our eyes is segregated into a number of elemental properties, such as luminance, color, and motion, that are processed in different visual centers in our brains. 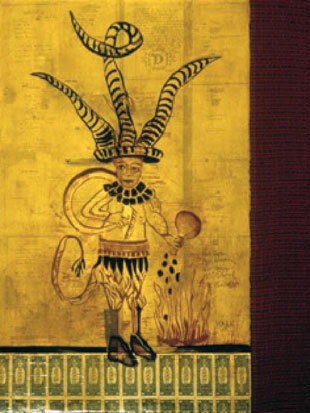 At the turn of the 20th century, artists played with these elements in their artwork. 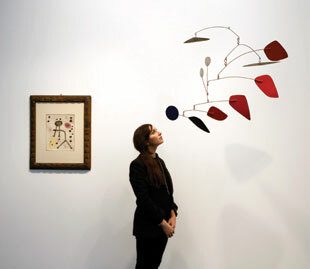 For example, the French artists Henri Matisse and André Derain highlighted color to express emotions, and the American sculptor Alexander Calder isolated visual motion in his mobiles (below), whose suspended components were delicately positioned to be moved by air currents or motors. Artists often depict mental representations of an object rather than its physical form. Their renditions do not adhere strictly to the light, shadow, and color properties of objects in the physical world, yet they appeal to us. Shadow contours are too fleeting and changeable to provide reliable information about real-world objects, so our brains never evolved to be sensitive to the shape of shadows. As a result, inaccurately shaped shadows in works of art are not displeasing to our eyes. By contrast, artists are typically careful to depict shadows as having less luminance than the object casting the shadow, as people are sensitive to the brightness of objects relative to shadows. Moreover, some artists, at least implicitly, use perceptual “tricks.” One such trick is the peak-shift principle, in which artists exaggerate certain features through the use of shape, shading, or color. The idea that exaggerated features enhance an intended response was first articulated in 1954 by the ethologist Nikolaas Tinbergen, who observed that seagull chicks more vigorously peck a disembodied long, thin stick with three red stripes at the end than they do at their mother’s beak, which has a red spot near the tip. But the use of the peak-shift principle in art predates Tinbergen. This perceptual mechanism can be seen in bronze sculptures of the 12th-century Chola dynasty in India, where the goddesses’ large breasts and hips and narrow waists enhance female sensuality, grace, poise, and dignity. American sculptor Alexander Calder isolated visual motion in his mobiles, whose suspended components were delicately positioned to be moved by air currents or motors. Artists also capitalize on the way the human visual system processes information in two interacting neural systems referred to as the “what” and the “where” streams. 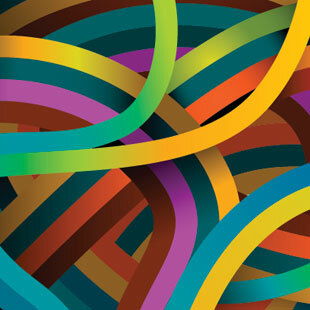 Form and color are processed in the “what” stream, revealing an object’s identity. Luminance and motion are processed in the “where” stream, which reveals an object’s location. Viewers of some impressionist paintings, such as Claude Monet’s Impression, Sunrise (opposite page), observe that the effect of shimmering on water surfaces or the sun’s glow on the horizon appears because the objects are painted with the same luminance but different colors. While the brain can identify these objects, their location is hard to fix, because the “where” stream does not register objects that have the same brightness as their background. Consequently the water and the sun in the Monet painting are seen as unstable in their location, lending the painting that shimmering quality. 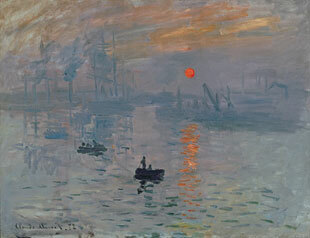 Sunrise Claude Monet, 1872MUSEE MARMOTTAN MONET, PARIS, FRANCE/GIRAUDON/THE BRIDGEMAN ART LIBRARYBrain damage can alter patients’ artistic abilities, sometimes causing notable improvements. The brain does not harbor a single art center. Artistic output is generated through coordinated activity in different brain regions organized in a flexible ensemble, which, like one of Calder’s hanging mobiles, rests in an equilibrium established by its weighted components. Brain damage alters that ensemble, removing particular components in a way that causes the entire configuration to shift. Such changes might render artists incapable of working or inspire new and interesting kinds of art. Viewers of some impressionist paintings, such as Claude Monet’s Impression, Sunrise, observe that the effect of shimmering on water surfaces or the sun’s glow on the horizon appears because the objects are painted with the same luminance but different colors. One type of damage that can affect artistic ability occurs in frontotemporal dementias, a group of degenerative neurological diseases in which patients experience profound personality changes. Such people can be disinhibited and disorganized, exhibit obsessive-compulsive tendencies, and have problems with language, attention, and the ability to make decisions. A few people with such dementias develop a propensity to produce art. This artwork is typically realistic, obsessive, and detailed—the graphical embodiments of acquired obsessive-compulsive traits. Some case studies support the hypothesis that disorders characterized by obsessive-compulsive traits can be accompanied by a preternatural ability to produce art. For example, one autism-afflicted child named Nadia could draw lifelike horses by the age of three despite many cognitive and social developmental delays. Among the most intriguing examples are those in which artists suffer some sort of brain injury or neurodegenerative disease that changes the way they paint in interesting new ways, as was the case with de Kooning. Another artist, German painter and printmaker Lovis Corinth, had a stroke that damaged the right side of his brain in 1911. Damage to the right hemisphere can stunt processing of information on the opposite side of one’s body and artists suffering such brain damage often neglect the left side of images that they produce. After his stroke, Corinth sometimes omitted details on the left side of his subjects’ faces, and textures on the left often blended into the background. (These later works were regarded highly by critics, one of whom wrote that Corinth had “become prescient for the hidden facets of appearance,” according to Howard Gardner, a professor of cognition and education at the Harvard Graduate School of Education.1) Damage to the right side of the brain can also result in spatial processing impairment. After American artist Loring Hughes experienced a right-hemisphere stroke, she had difficulty coordinating the spatial relationship between lines, which forced her to abandon her realistic style and adopt a more expressive one. The Assessment of Art Attributes (AAA), which I published with collaborators in 2010, allows researchers to quantitatively assess an artwork’s formal visual attributes, such as overall complexity, balance, and color saturation and temperature, as well as the qualities of its content, including abstractness, realism, and symbolism. My lab recently applied the AAA to the works of Corinth, Boiadjiev, and Sherwood to reveal that the right hemisphere is not dominant for artistic production, as is commonly believed.3 Rather, the paintings of all three artists, two of whom had left-brain injuries, became more abstract and distorted, less realistic and accurate, following brain injury. The works were also rendered with looser strokes, more flatness, and greater vibrancy. Clearly, both hemispheres participate in artistic production. Katherine Sherwood, 1992© KATHERINE SHERWOODNot only does the visual brain segregate properties like luminance, color, and motion, it also segregates higher-order objects, such as faces, bodies, and landscapes. Portraits activate the “face area” in the fusiform gyrus and landscape paintings activate the “place area” in the parahippocampal gyrus.5 Surprisingly, these sensory areas may also be involved in evaluating objects, rather than simply classifying them. For example, faces deemed to be beautiful by the viewer activate the fusiform gyrus and adjacent areas more than do faces deemed less beautiful.6 The issue of how much and what kind of valuation takes place in sensory cortices is an area of active neuroscientific inquiry, with implications for how neural structures involved in perception and evaluation are integrated. Functional neuroimaging experiments dissecting our emotional systems during aesthetic experiences are starting to reveal neural correlates,7 and to extend the reach of neuroaesthetics beyond simple pleasures to negative emotions such as sadness that can have aesthetic appeal. The pleasure that people derive from viewing objects they find beautiful taps into our brain’s reward circuitry. Faces perceived as attractive activate face-processing brain regions and also excite parts of the ventral striatum.9 Beautiful visual images similarly trigger activity in the ventral striatum, the ventromedial prefrontal cortex, and the orbitofrontal cortex—areas involved in coding our pleasures—and the insula, which is linked to our autonomic nervous systems. Different kinds of pleasures, including music, visual art,10 and even architectural spaces,11 ignite the orbitofrontal cortex. Expressionist theories claim that the communication of emotions is the fundamental function of art. Art transmits subtle emotions that are difficult to convey with words. For example, the delicate sadness evoked by masks worn in the classical Japanese musical theater called Noh engages the right amygdala.12 Deeply moving images, as opposed to artworks that we merely like, activate parts of the prefrontal cortex,13 and empathetic responses to artworks engage emotional circuitries of joy, fear, and anger, mirroring the emotions depicted in paintings. 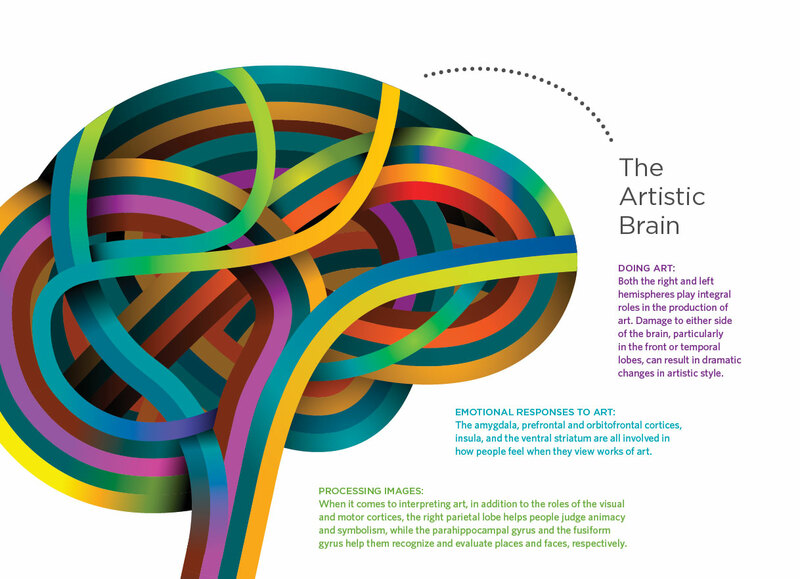 See full infographic: JPG | PDF© ANITA PONNE/SHUTTERSTOCKOur own experiences and knowledge also have a profound effect on how we experience art. People rate abstract art as more attractive when they are told it is from a museum, as opposed to generated by a computer. This preference produces greater neural activity in the medial orbitofrontal and ventromedial prefrontal cortex.14 Believing an image to be a museum piece also produces more activity in the entorhinal cortex, an area important for episodic memory. Similarly, people’s ventral striatum and parts of the orbitofrontal cortex are more responsive to the “art status” or the authenticity of a painting than to its actual sensory content.15 Again, knowledge, more than the hedonic qualities of the visual image, modulates these neural activation patterns. To further our understanding of neuroaesthetics, researchers are turning to new, noninvasive brain stimulation methods, such as the use of transcranial magnetic pulses or direct electrical currents, to produce virtual lesions or enhancements to parts of the brain. 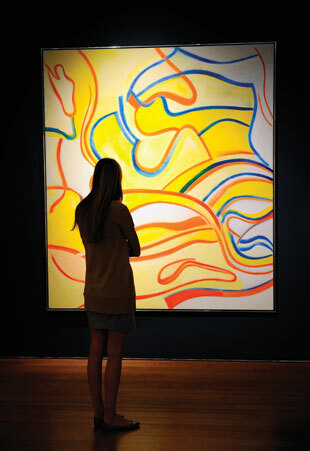 For example, stimulating the left dorsolateral prefrontal cortex can increase people’s appreciation of representational art, paintings of objects as opposed to abstract works.16 This method offers great promise as an investigative tool for exploring the interactions between sensory-motor circuits, emotion processing, and the emergence of meaning. While current neuroscientific methods are adept at probing stable and relatively universal properties of our minds, they are challenged by historically contingent qualities of art, such as the intent of an artist or redefinitions of what constitutes art, as French-American artist Marcel Duchamp did famously with his urinal museum piece in 1917. Artworks are often vehicles for ideas embedded in specific contexts. The meaning of individual works of art can be fluid and subject to different interpretations across viewers, cultures, and time. Reactions to art—whether joy, disgust, or anger—often pertain to the ideas being conveyed. Understanding the context in which the work was produced, the intent of the artists, and the historical and cultural conversation in which it was engendered enhances one’s appreciation. Neuroscience methods do not easily grasp these complex aspects of the richly textured meaning of art. Neuroscience methods do not easily grasp the complex aspects of the richly textured meaning of art. Anjan Chatterjee is a professor of neurology at the University of Pennsylvania, where his research focuses on spatial cognition and language, attention, neuroethics, and neuroaesthetics. He is also a neurologist with a clinical focus on cognitive disorders. Chatterjee is the author of The Aesthetic Brain: How We Evolved to Desire Beauty and Enjoy Art and coeditor of Neuroethics in Practice: Mind, Medicine, and Society and The Roots of Cognitive Neuroscience: Behavioral Neurology and Neuropsychology. H. Gardner, The Shattered Mind: The Person After Brain Damage (New York: Alfred A. Knopf, 1975). K. Sherwood, “How a cerebral hemorrhage altered my art,” Front Hum Neurosci, 6:55, 2012. A. Chatterjee et al., “Artistic production following brain damage: A study of three artists,” Leonardo, 44:405-10, 2011. B. Bromberger et al., “The right hemisphere in aesthetic perception,” Front Hum Neurosci, 5:109, 2011. H. Kawabata, S. Zeki, “Neural correlates of beauty,” J Neurophysiol, 91:1699-705, 2004. A. Chatterjee et al., “The neural response to facial attractiveness,” Neuropsychology, 23:135-43, 2009. S. Brown et al., “Naturalizing aesthetics: Brain areas for aesthetic appraisal across sensory modalities,” NeuroImage, 58:250-58, 2011. M.A. Umilta et al., “Abstract art and cortical motor activation: an EEG study,” Front Hum Neurosci, 6:311, 2012. H. Kim et al., “Temporal isolation of neural processes underlying face preference decisions,” PNAS, 104:18253-58, 2007. T. Ishizu, S. Zeki, “Toward a brain-based theory of beauty,” PLOS ONE, 6:e21852, 2011. O. Vartanian et al., “Impact of contour on aesthetic judgments and approach-avoidance decisions in architecture,” PNAS, 110:10446-53, 2013. N. Osaka et al., “Neural correlates of delicate sadness: an fMRI study based on the neuroaesthetics of Noh masks,” Neuroreport, 23:26-29, 2012. E.A. Vessel et al., “The brain on art: Intense aesthetic experience activates the default mode network,” Front Hum Neurosci, 6:doi:10.3389/fnhum.2012.00066, 2012. U. Kirk et al., “Modulation of aesthetic value by semantic context: An fMRI study,” NeuroImage, 44:1125-32, 2009. S. Lacey et al., “Art for reward’s sake: Visual art recruits the ventral striatum,” NeuroImage, 55:420-33, 2011. Z. Cattaneo et al., “The world can look better: enhancing beauty experience with brain stimulation,” Soc Cogn Affect Neurosci, doi:10.1093/scan/nst165, 2013.